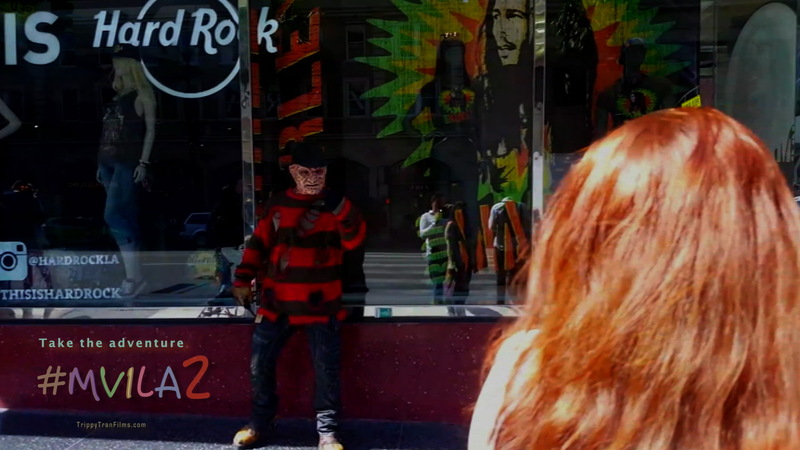 Erin meets something of iNPersonNation with new My Vacation In L.A. season 2, episode 5 “Hollywood Walk of Fame”. Dreamers see beauty and excitement in the little things life has to offer and imagine more. Others see things from a realistic perspective and live their lives with each step as it goes. As both personalities are shown in contrast, the “Turn This Around” theme is complimentary in the new episode of season 2 of My Vacation In L. A. – and it’s shocking to see what happens next. From the “Vacation In” docu mini-series, a new group of pals visit the west coast hosted by recent resident Anthony “Rory” Tran who takes us on another trip this season to Hollywood with a day at the Walk Of Fame. Travel spots include treading on the Sunset strip, Hollywood Blvd, and even the infamous Union Station that many travel around Los Angeles by. Where will they go next? Like the official My Vacation In L.A. page. Now if you’ve been watching the show since season 1, the adventure with Alicia was a bright and colorful experience from Venice Beach, Santa Monica Pier, Rainbow Harbor in Long Beach, Knott’s Berry Farm in OC and Hollywood celebrity home tours and the Hollywood Wax Museum. The documentation presented a “live” and even truer mix of Vlogging and documentary-style recording than mainstream television showing us more than flashy cuts and more about the content and convos while complimenting these unique adventures. R.I.P. Christopher Corman. Read an article about our actor who passed at 31. In season 2, we’ve so far seen LAX, The Loop and DTLB nightlife (which brought back My Vacation In L.A. – Top 10 Countdown star Ash Nicole), Seal Beach in OC, Ripley’s Believe It Or Not! Hollywood museum and it’s looking like (spoiler alert!!!) the next adventure includes Universal Studios. A sort of distance began to gap between some people during that week in this season with the introduction of 2 new people that our lead girl Erin knew. The end of this episode has come as a big shock to viewers who are saying they “…Can’t believe it happened like that” and “Wow…surprised it went there” about actions taken by the Obliquity: Imagery of the Unknown star that you can experience in our latest entry. The Radio Broadcast is also featured in our Halloween Hell event from 2009! Watch that throwback here! This Halloween and fall season, treat yourself to our mystery suspense with #DenizenFilm. Watch for FREE and be sure to check out our other spooky goodies. Be sure to like all the pages and tell us what your favorites are! Keep it locked in for exclusive independent artists, filmmaking, talents and original content here at Trippy Tran Films and on our social media pages.